The type of functionality available to each user is dependant upon the licence type and the permissions they have been allocated on a project and can even be adjusted down to specific documents if required. It is up to you how to apply permissions either keep it simple or create lots of custom permissions groups to have fine control over different users. Each new project comes with four standard permissions groups; No Access, Read, Read/Write and Modify. Users start in No Access and you can move them into the other groups so they can get increasing access to capability on the project. This simple mode works well off the shelf for internal projects and can be managed by the PM once they have been given their ‘Modify’ permission. If you want to refine access for these user groups you can move default permissions for a group on a document by document basis so giving the ‘Read’ group no access to project finances but read/write access to the risk register. To extend this further you can create an unlimited number of custom permissions groups for particular users within a project e.g. Customer and then grant permissions. The permissions control the ability to chance files and documents or add new material. Permissions also control access to search, report , set up notifications, undertake assurance activities and much more. 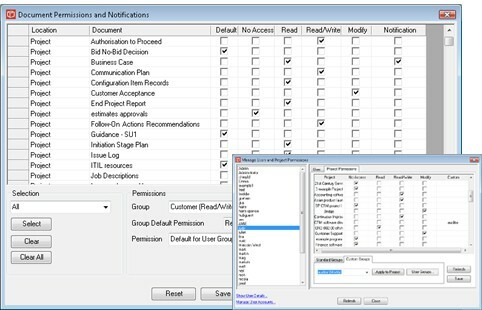 Additional top level permissions flags control access to portfolios and administration capabilities like creating projects, new users or allocating licences to user accounts. When you are defining your method template you can pre set the document permissions associated with each user group. The user’s licence determines fundamentally what type of interface they can use and the feature set available to them. View the full Permissions Matrix to see exactly what is available to users with each licence type. Administrators can move licences around between users whenever they wish allowing for great flexibility. Community and Personal Edition – No permissions management the single user has access to everything. Enterprise and Live Edition – Full permissions management as described. You decide how many licences of each type you want on your system. You can add more or reallocate them any time you wish.